In ordering a one- or two-day pass, you’ll be whisked around Paris, with the option to hop-on or hop-off wherever you like and without limits, providing you plenty of flexibility in your itinerary. Buses frequent each stop around every 5 – 15 minutes, so if you choose to hop-off along the route, you won’t be waiting long to continue on your way. Where do the Red buses go ? As a European centre of culture and politics, Paris has a wealth of history, spanning hundreds of years. Kings, emperors, revolutions, wars – Paris’ rich background is reiterated in its rich backdrop of stunning architecture and natural beauty. 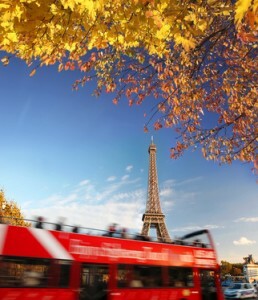 You will see all the highlights of this enchanting background and backdrop with a red bus pass, as the route tours past the most iconic buildings such as the Eiffel Tower, Notre Dame, and the Arc de Triomphe, as well as the Opera houses and museums, which you can certainly hop-off to visit. Where can I hop-off ? There are nine hop-off locations, each placing you within walking distance of one of the iconic landmarks of Paris. Check out the route on their website. You may stay off the bus for as long as you’d like and, once you’re ready to continue, simply hop-on again at the nearest stop. It’s as easy as that. What’s the historical commentary ? The red bus sightseeing tour includes a personal audio guide, which will inform you about the history of the sites and landmarks you pass throughout the city. Commentary is available in English, French, Italian, Spanish, German, Russian, Japanese, Mandarin Chinese and Brazilian Portuguese. A 1-day adult ticket starts at €24.30, while a 1- or 2-day child ticket is €13.50. 2-day adult tickets start at €27.90. There is also a bus and cruise option, which combines a hop-on, hop-off bus ticket with a one-hour cruise down the River Seine. The 1-day cost for this combination ticket is €32.30 for adults and €18.50 for children, while the 2-day cost is €35.90 for adults. Article précédent Le Bus Rouge : Paris sous un autre oeil !